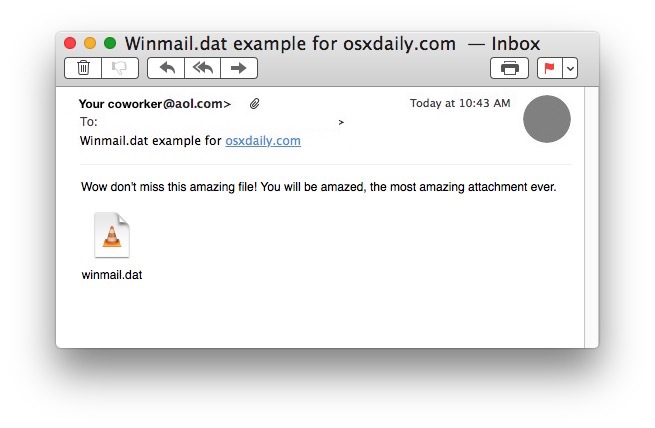 Many Mac Mail users who send and receive emails with their Windows counterparts using a mail client like Outlook or Microsoft Exchange will discover a “winmail.dat” file attached to those emails. If you try to open a winmail.dat file on Mac OS X, you’ll usually find there is nothing available to open the attachment, or it often contains gibberish and is illegible. 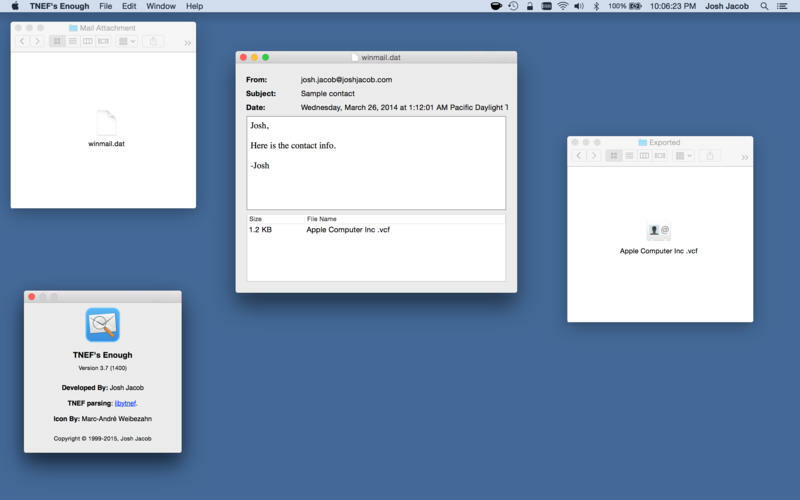 We’ll show you several ways Mac users can open winmail.dat files attached to emails. 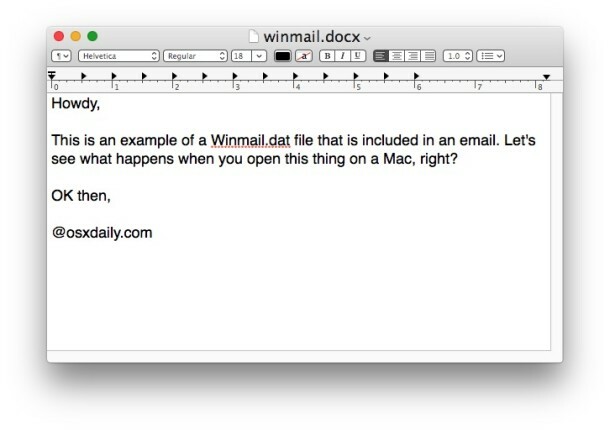 We’ll also explain what a winmail.dat file is and where they come from. Winmail.dat files are generated by Microsoft Exchange and Microsoft Outlook, Mac users typically find them arriving in emails sent from the Windows world and opened in Mail app, and the winmail.dat files can be one of two things; rich text formatting for an email (for example, bolded text, or a stylized HTML email signature, a vcard), and less often, they can be an actual email attachment file which has been wrongly identified as winmail.dat, but is actually a Word document, calendar invite, Excel spreadsheet, RTF file, or some other legitimate file type that has been attached to the message. Do keep in mind if the winmail.dat file is simply a rich text version (TNEF) of the email that has been received, there is little reason to open it, as it would simply be a stylized version of the email you already received (much like the difference between TXT vs RTF files). In fact, Apple actually tells you to ignore winmail.dat files completely if they arrive in Mail app, which is often fair advice, but in some situations the winmail.dat file is an actual email attachment that has been misidentified, and thus need to be opened. Because it can be difficult to know the difference between the two ahead of time, it’s important to know the intention of the email sender, if it’s just a casual message with a small winmail.dat file attached, it can usually be ignored, whereas if the sender is referring to an attached document which has shown up as a winmail.dat file instead of whatever they reference, you’d likely want to try and open it. 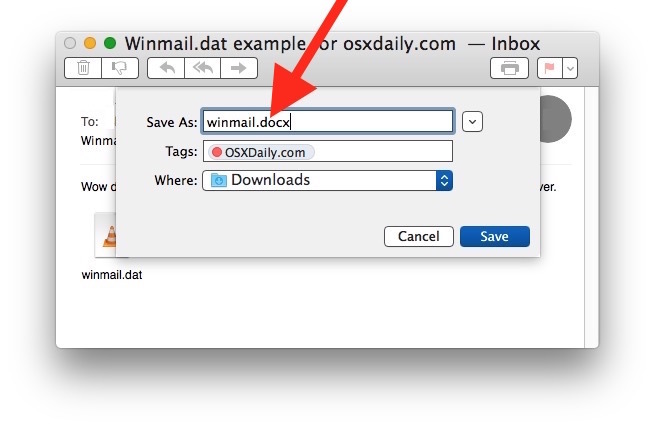 Often the easiest way to open a winmail.dat file in Mac OS X is to save it and relabel the file as the intended file type. For example, if you get an email from an Outlook user in Windows saying “attached is the import Microsoft Word document” then you’d know it is supposed to be a .doc or .docx and can be treated accordingly. Be sure you have the show file extensions feature of Mac OS X enabled for best results. This is admittedly a little silly, but file extensions identify what a file is and how it opens in all operating systems, so even if a file is one type it can be misconstrued as being another if the extension is wrong – whether Mac OS X or Windows. The good news is despite being a bit of a workaround, this works to open winmail.dat files almost always on the Mac, assuming it’s a file that has been misidentified. You can also save the winmail.dat attachment to the Finder and relabel the extension there, which can then be opened as usual. 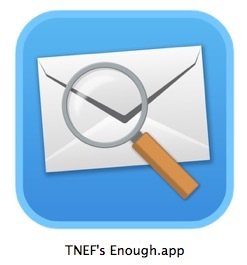 If you’re a Mac user who frequently encounters many emails sent from Windows users with ‘winmail.dat’ attachment files, another approach is to use a free tool called “TNEF’s Enough” (Sound it out, teneffs enuff – creative!). This is probably the best approach if you see and encounter many winmail.dat files on the Mac (whether in Mail or otherwise) and want to always get to the bottom of them quickly. Once installed, you can use TNEF’s Enough with the “open with” menu, or by dragging and dropping the winmail.dat files into the application itself. The app will then sort out what the winmail.dat file is supposed to be for you, which you can then save or export yourself directly from the app. 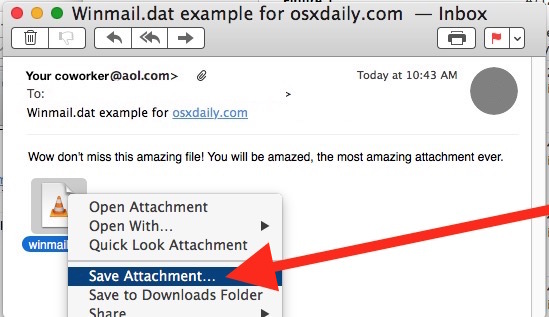 Often you’ll find the winmail.dat file is just a boring rich text formatted email sent from Microsoft Outlook or Microsoft Exchange, but as we’ve mentioned, they can also be misidentified attachments too. The “winmail.dat” file can contain attachments, contact files (.vcf) or calendar files (.ics) as well as a rich text or HTML version of the email body. TNEF’s Enough can open the “winmail.dat” file and allow you to extract the attachments. This app works really well, so if you find yourself with a regular dose of winmail.dat mysteries to deal with, it’s a worthwhile install. It’s free, and there’s even an iOS version available too for those who encounter the same attachments on the mobile side of things. The Gmail web based email client has no problem handing winmail.dat files, and will almost always accurately interpret the winmail.dat as either a rich text formatted email, or as an accurate file attachment. This is literally just a matter of forwarding the email in question to your own gmail account, then opening GMail.com in a web browser to view and open the file. The winmail.dat file will either be rendered as a formatted email as intended from the Microsoft Outlook / Exchange side of things, or you can open it within Google Docs on the web. This forward approach is not a fancy solution, but it works great. Finally, you can also just request the sender in the Windows world stop sending their emails in rich text format and instead send them as plain text, but that’s not always possible, and not every sender is compliant. Plus, with how popular HTML signatures are, it may not be a reasonable solution anyway. Like .m4v files that you have to rename to .mp4 right? Letter Opener Pro looks like a great option, haven’t seen this one before! Thanks! Sounds like a great $39.95 solution. The “lite” version apparently displays the information without formatting which other free tools can do, as well. But I just read the only thing different (from the message body text) about winmail.dat is the formatting….Anyway, I’ve used $19.95 of my budget writing this…..
Any El Capitan user cannot open any Mail with attached graphics send via MS Outlook. Text is okay bit important graphics have a string attached which prevents them to open. This is essential since Apple Mail missing other essential features Outlook has. This applies only to El Capitan any predecessor as well as every iOS 9 has no problems. Any fix for that? We try with Apple since last September but after initial interest they do not answer anymore. I rather see this problem sorted out by Apple, they need to understand that Outlook (or any other MS Office tool) is still the most used mail client in this side of the universe. Thanks for this article. For years I’ve occasionally received a winmail.dat file as an attachment from clients when I expect a pdf. Previously I would have to ask the client to resend as a pdf. Now I know what to do these files. ThanX a lot – especially the way using the Google mail is very easy and useful, in combination with Google Drive You can easy kill the f*****g DAT files! Exactly what I needed in super clear explanation and steps to fix. Thank you!!! Thank You for writing this. Very easy to understand. Method 2 (TNEF’s Enough) was exactly what I needed. I had downloaded a lite version of another program and would have to pay to open the winmail.dat attachment directly from the email. downloading an attachment when unnecessary not only wastes time but after years of email attachment attacks on Win, I learned not to do. Of course, the App Store didn’t even list TNEF’s Enough (and their Free area is pathetic), but when I was ready to install the App store somehow found it. I understand monetization well, but before we were fighting for Net Neutrality (and we’ll have to continue to, apparently) there was the concept of open access to read any type of file (assuming it could be human read) – the kind of thing that should be built into an OS by now. Thanks for reminding us what’s available and especially thank you to the developer. Many thanks for the tip – TNEFS enough worked brilliantly – I used in a looooong time and ago too, never thought I’d need it again. I got winmail.dats from a PC client. Re your final paragraph – how do you mean it’s not always possible? 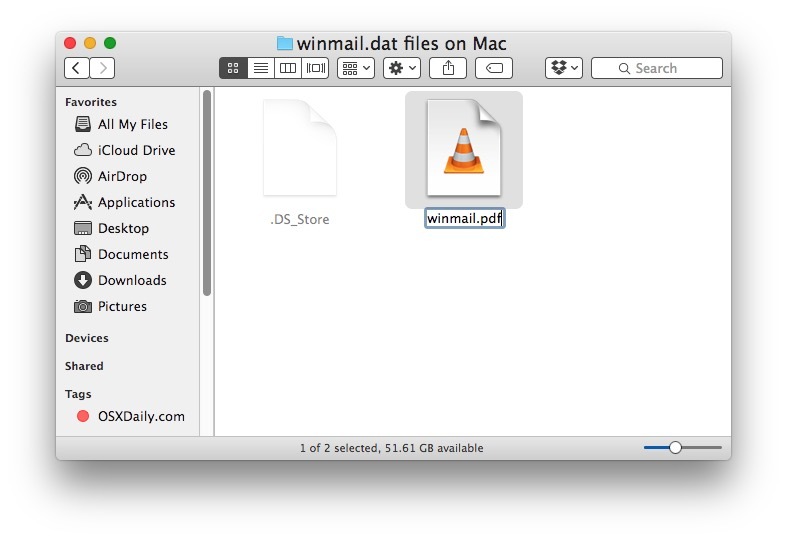 Is this really the case – that sometimes a winmail.dat file is just a normal file that’s been misidentified? I was of the understanding that it’s always a package containing the email message (in RTF) along with any attachments, similarly to how a zip file is a package of files.